I had a post from a few years ago on false colorization. It has since been deleted during my big update of correcting the broken image links on my blog, but this is the new version. There was a viral post circulating its way around social media that showed some skillful colorization of old photos, and it got me thinking about the project again. Something I seldom get requests for, but there seems to be a wealth of similar work available these days. I took two hours from a rainy afternoon indoors to put this one together to advertise what I can do. How about a few tips for doing this yourself? 3. remember how light and shading affects colour, having experience with loads of photos helps. 4. aim to nail your skin tones - if the skin tones look off, the whole thing will. 5. adjust your exposure after the color is applied with dodging and burning. Black and white photos from real film cameras were made using optical colour filters which would brighten and darken different colours, and not necessarily hold them true to their real luminance value in relation to one and other. thanks for reading, have fun practicing your false colorization. Also contact me if you have some photos you want me to do for you with false colorization! Flat rate per photo, bulk discount may apply if you require volumes. I'll show you what I 'painted' taking away all of the original photo data. Showing it against a 50% grey backdrop. 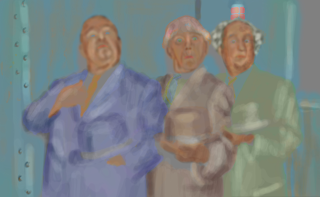 The "Colorization" layer which includes none of the original photo data. 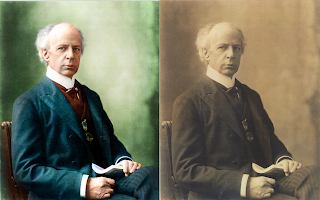 And one more example of Sir Wilfrid Laurier, our great country's seventh Prime Minister and the face of our five dollar bill. An example of Sir Wilfrid Laurier recolored.